As a homeowner, you may be in the midst of planning your flooring project. Whether the tiles in the kitchen are past their prime or the carpet in the hall is worn bare, now is likely the best time to roll up your sleeves and get to work. Many DIYers today are benefitting from the protection and cost-effectiveness of laminate flooring. This pressed product protects against wear and tear and can work well in areas with moisture. One important aspect that is vitally important to this process is a laminate underlayment. You have a wide range of choices when it comes to floor underlayments, such as felt, cork, foam, and other applications. Eco Cork Foam is here to provide optimal protection for your floors. We proudly engineer our products to provide the best underlayment for laminate flooring and more. Each roll of ECF is composed of a quality blend of polyethylene foam and cork to deliver long-term performance and value. Our laminate flooring underlayment is built to provide amazing results with a unique composition, but it is one among many options available. 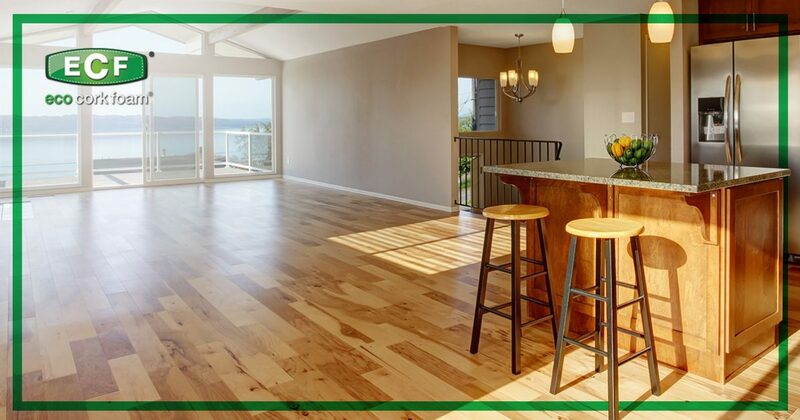 Today, we’ll highlight the basic types of underlayments available for your laminate floor. If you’re looking for a proven choice in home improvement, be sure to check out ECF at your local Home Depot or on www.homedepot.com! Smoothing minor imperfections. Laminate flooring is beneficial, but its soft nature can make small bumps and gaps very noticeable once everything is finished. Even one high spot or divot in your new floors can feel like a disaster, so be sure to invest in the right floor underlayment! Softer footsteps. Padding beneath your feet will provide a softer feel. Be careful with your underlayment thickness, though, as your laminate flooring needs proper support to for long-term benefits! Remember that laminate can be very susceptible to damage if exposed to moisture, and basic underlayments do not involve any protective measures against water and humidity. Unless you are placing your planks or tiles on an even OSB surface in an area with little moisture, we recommend investing in a better option. Those looking for good results with their laminate floors will be better off investing in a 2-in-1 underlayment. This style provides cushioning and support, as well as some moisture protection. If you’re installing over concrete subfloors or working in areas with water concerns, 6 mil vapor barrier is often required in order to keep everything dry and safe. Laminate floors over concrete are always a challenge, as the damp nature of the basement often makes floors feel even colder. 2-in1 underlayments do not have a 6 mil vapor barrier, so you would need to purchase an additional vapor barrier if you intend to install on concrete. You can expect to spend a modest amount to gain peace of mind with a 2-in-1 floor underlayment. The 3-in-1 underlayments are commonly referred to as the better in the flooring world. Basically, you receive the comfort, support, and protection from the previous products, as well as the benefit of sound dampening. Sound reducing underlayments reduce acoustic transmissions, making for quieter foot traffic and overall acoustics. While the price normally associated with this top-notch product may not seem worth it, remember that sound transmission in high-population areas can be stressful. Apartment complexes, schools, office buildings, and other structures can all benefit from acoustical floor underlayments, as the sounds from footsteps and dropped items are drastically reduced. Support – ECF is 3.2mm thick, providing superior structural integrity to your new flooring system. Our underlayment is designed to provide protection at all levels. Comfort – Our laminate underlayment is designed to provide amazing comfort in addition to rigid protection and support. With a quality thermal insulation rating and resilient foam structure, ECF can help you relax. Vapor control – ECF is the only laminate underlayment that comes with a 6 mil vapor barrier built in. ECF meets the IBC’s permeability codes, rated to provide the highest level of protection. Because our vaport barrier is built-in, there is now need to buy an additional one, saving you time and money. Acoustic perfection – It’s hard to argue with math and science, and our floor underlayment is tested to ensure that you receive superior sound reduction with your new laminate. According to ASTM standards, our product excels in impact insulation and sound transmission. With industry topping ratings, IIC-73, STC-63, and Delta IIC-23, ECF will help keep your space more peaceful. If you’re looking for a quality underlayment for your laminate floors, it’s important to make the best choice to ensure a beneficial outcome. Eco Cork Foam was designed to be the best, period. Our cork foam blend is structured to provide the best protection on all fronts. Contact us today to learn more or buy ECF to see the results yourself!